Hawaii ranchers are hopeful that a small beige-colored moth will be able to control the fireweed, an invasive plant that is toxic to livestock and has caused havoc on the state’s prime pasturelands. For more than 13 years, entomologists and researchers at the Hawaii Department of Agriculture (HDOA) have literally searched the world for a natural enemy of the weed that would be safe to release in Hawaii. The most promising turned out to be an insect called Secusio extensa (Arctiidae), the Madagascan Fireweed Moth, the larvae of which voraciously eats the leaves of fireweed. It is believed that the weed came to the islands in hydromulch material imported from Australia where it is a serious pest. 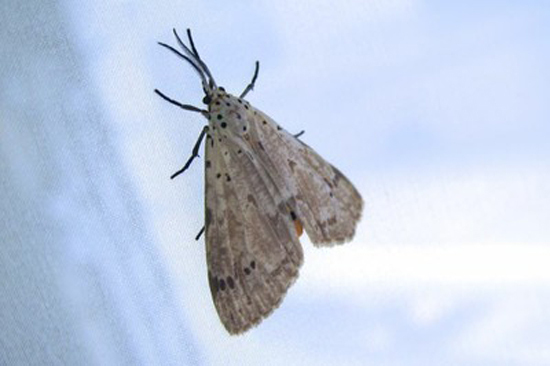 HDOA entomologists on Oahu have begun stepping up production of the moth after receiving the long-awaited approval from the U.S. Department of Agriculture (USDA), which came on Dec. 6, 2012. The state approved the release of the moth in 2010, but also required approval of a federal permit. The first release of the biocontrol insects is slated for early 2013, depending on the rearing of the insects in the laboratory. 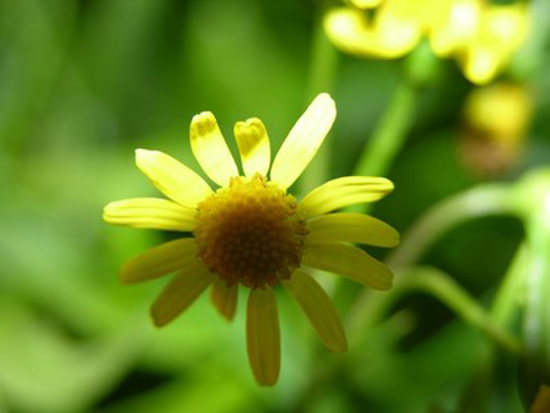 In 1999, HDOA began looking for a biological control for the pretty but deadly plant with yellow daisy-like flowers, also known as Madagascar Ragwort. It is estimated that the weed has infested more than 850,000 acres, mainly on Maui and Hawaii Island. Although there are effective pesticides, it is expensive and impractical to use across hundreds and thousands of acres. Besides Hawaii, fireweed has spread through many parts of the world killing animals in Australia, Brazil, Argentina, Colombia, Venezuela, Uruguay, and Japan. Secusio will be the first biocontrol agent to be released against Madagascar fireweed in the world. HDOA’s exploratory entomologist, Dr. Mohsen Ramadan, traveled to Australia, South Africa and Madagascar in 1999 and returned with 14 insects and one fungus, which were researched and tested under quarantine conditions. Some were found to be ineffective, while others were found to harm other native or beneficial plants. Ramadan traveled to the region again in 2005, 2007, 2011 and 2012 to look for more potential biocontrols for fireweed and other pests, such as coffee berry borer, small hive beetle and the protea mealybug. Biological control, which utilizes natural plant enemies and/or diseases, is needed in natural and managed ecosystems as a tool for managing invasive plant species that are too widespread and expensive to control using herbicides and/or mechanical removal methods. Although challenging to implement, effective biocontrol can provide long-term, large-scale, highly selective control of otherwise prolific weeds. Current research methods thoroughly test potential biocontrol agents prior to release to ensure that they only attack the target weed and not other native or beneficial plants or animals. Hawaii continues to be a leader in biocontrol of pests. The Kingdom of Hawaii was a world leader in biocontrol with successful introductions of a beetle to control cottony cushion scale in 1890. After Hawaii became a U.S. territory in 1900, biological control methods progressed with the introduction of several insect species to control lantana in 1902. Since then, researchers in Hawaii continue to be internationally recognized in biological control of weeds and plant pests and have collaborated with colleagues worldwide on the biological control of invasive weeds and pests such as miconia, fountain grass, banana poka, ivy gourd, gorse, wiliwili gall wasp and nettle caterpillar, among others.